The Shoah is the most monstrous atrocity people did to people. The fact that the Nazis systematically, industrially and brutally killed six million Jews is something which goes beyond any imagination. Although the Nazis have luckily failed in exterminating the Jews as a people, their attempt to annihilate their rich culture was more successful. Especially in Germany and Eastern Europe Jewish religion, literature, music, cuisine, art architecture, etc. was suddenly gone after 1945. 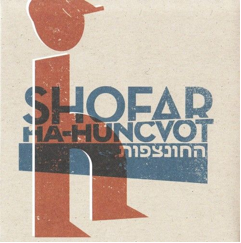 More than 50 years later Mikołaj Trzaska (alto saxophone and bass clarinet), Raphael Rogiński (guitar) and Macio Moretti (drums) started their project Shofar, which tries to resurge at least Jewish musical culture in these places. Based on the work of ethnomusicologist Moshe Beregovski (who has collected recordings in Ukraine, Poland and Moldavia), their approach is looking for a common denominator of old Hasidic tunes like nigunim (stylized improvisations based on thematic passages used to reflect the mystical joy of intense prayer), Klezmer dances like freylekhs (which is short for the Yiddish “freylekhs shtikele” and comes from the German “fröhliches Stückchen“ meaning “ delightful/happy piece”), contemporary free jazz and DIY/alternative rock. Obviously, this is not far away from everything John Zorn is involved in (“Ha-Huncvot” would have been a great Tzadik release indeed), the music also reminds of Dave Douglas’ Tiny Bell Trio or Jacob Garchik’s beautiful collection “The Heavens”. The album itself is structured around three “Traditional Hasidic Melodies“, all of them marvelous melancholic pieces, albeit they are different in detail. The first one is a shy and delicate tune in which Rogiński sounds like a minimalist Bill Frisell seeking Trzaska’s alto for unison dances. The second and third melody pick up the unison interaction of guitar and bass clarinet/alto but while the second one is very somber as if it was announcing something terrible, the third one with its rising intensity in the second part seems to get back joy almost defiantly. The other pieces are wilder and sometimes they display an almost excessive kind of humor. “You + Cookie = Happiness” is a shredded joyride between Gustafsson-like alto howls, Minutemen/No Wave guitars and intimate guitar/drums conversations. Another example is “To think more positively about Germans” (you can also ask Paolo how this works), a track with a latent tension, you literally wait until it bursts (which does not happen). Highlights are the bookending tracks “I see through my nose” with its elegant and cheerful duel between alto and dubbed guitar and the fidgety and nervous “Dinner with the giant” which cuts off the album as abruptly as Jewish culture was ended in Eastern Europe. A very beautiful and recommendable album.